Spell Forest is quite an ‘old’ band, nowadays terrorizing our globe for more than two decades. They were formed in 1995 in São Paolo, Brazil, with members included from other notorious acts such as Mythological Cold Towers, Vobiscum Inferi, Crux Caelifera, Cruor Cultum and other aural greatness. In Summer last year the band did release their seventh full length album (via France’s Drakkar Productions), but this review deals with a re-release of an older recording, not a new one. 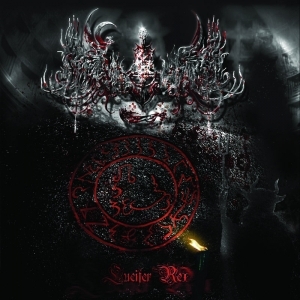 Actually, Lucifer Rex was initially recorded in 2004 and 2005 at the Ancient Valley’s Tower Studio, and released in early Autumn 2005 via Goat Music Records by composer / vocalist / guitar player / keyboardist / lyricist / producer Lord Mephyr (the only member still involved with the band in mean time), bassist Daemon, drummer / co-producer Hamon, and guitarists Vlad D’Hades and Shammash. This re-release comes with two live tracks as bonus, and includes the original (hidden) outro too. I am a fan of several kinds of Black Metal for about three decades (yes, I’m getting old…), but the ‘traditional’ or so-called Second Wave trend must be one of the mostly preferred ones for sure. So imagine my enthusiasm noticing that these Brazilians are still doing the very same thing they were going through twenty years ago. Spell Forest have always been inspired by the Nineties approach, and that has not changed. But what’s even ‘better’ is the fact that 1) their performance is extremely satisfying, and 2) they are distinctive from the grey masses. I will go little deeper into both aspects. In general, Spell Forest come up with a recognizable approach, not exactly totally different or reinventive. However, they succeed to maintain a certain variety, not only in tempo, yet also in execution. About that tempo: in general, everything is quite speed-up. Especially the blasting drum salvos penetrate the whole with an energy that creates a spirit of war-lust and fearless pride. Yet a couple of slower passages, and the use of (semi) acoustic excerpts, are like a great counterbalance in front of the energetic sonic supremacy that defines Lucifer Rex. Also, give a deeper listen to the bass lines as well, for these too are unique and crafted performed.